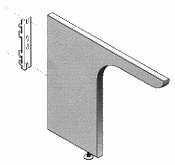 Use the Center Bracket to support 2 adjacent counter caps on a straight-line run Price: $12.24 ea. The End supports the end of a counter cap that is the end panel in a run. The Mid-End bracket is used at the end of a counter cap above a 2, 3 or 4-way connector. 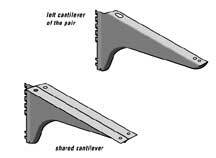 Cantilevers support worksurfaces (24" D & 30" D) by fitting into the slotted verticals on panels, as well as, fitting into wall hanger strips affixed to walls. Pencil drawer is injected molded plastic, 3-compartment front with open storage in back. Drawer Bearer is injected molded plastic-smooth , quiet strong-anti-tip drawer catch. Designed to be compatible with OEM products.